Made in these vibrant colors, this set is sure to be a hit at your next spring or summer barbecue!!! 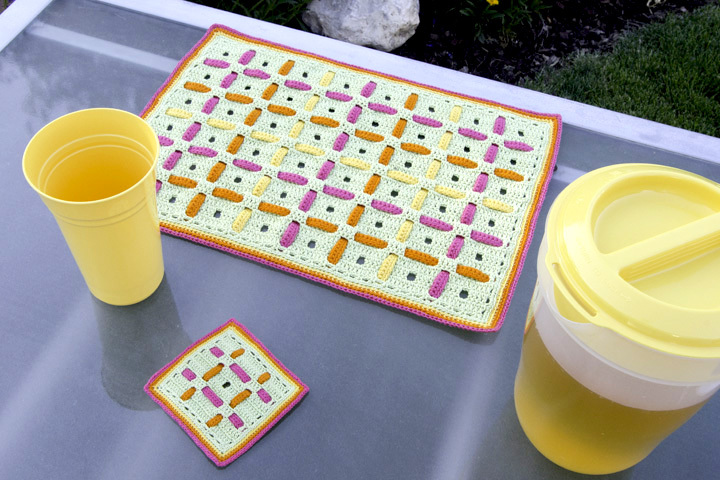 This placemat set is made in the filet crochet method with dc and ch-2 sps. It has added strips of crochet that are woven through the appropriate ch-2 sps for visual interest! The placemat is made with 2 strands of size 10 cotton crochet thread held together throughout and the coaster is made with only 1 strand of the same threads. You can choose to make these projects in any colors you desire for spring, summer, fall or winter décor! This pattern includes written instructions and a crochet symbol chart for each project.